Last week saw a pitched battle outside Indonesia’s parliament building, with water cannons and tear gas deployed on 10,000 protestors. The reason? Proposals from the government to cut the country’s subsidy for petrol and diesel. Similar scenes greeted ultimately unsuccessful attempts by the Nigerian government to cut subsidies in January this year. In the year that sees a major international conference in Rio on sustainable development, cuts in fossil fuel subsidies would be very welcome. Global spending on such subsidies may be in the region of $600 billion this year, and they make dirty fuels like oil and coal cheaper – a sort of negative carbon tax. Moreover, they use up vast sums of public money that could be spent on health, education or infrastructure. Last year an estimated 20% of government spending in Indonesia went on fossil fuel subsidies, and in some Indian states, an even higher proportion goes to keeping coal-fired electricity cheap. This represents a vast potential development dividend. Even worse, most of the benefits usually flow to the middle classes, who consume most of the petrol and electricity. Of the $22.5 billion spent by India on fossil fuel subsidies in 2010, less than $2 billion benefited the poorest 20 per cent of the population, according to International Energy Agency figures. The situation in Indonesia, Thailand, Pakistan and South Africa was similar and that in China only slightly better. So on paper fossil fuel subsidy reform looks like an easy win-win policy for both the environment and development. 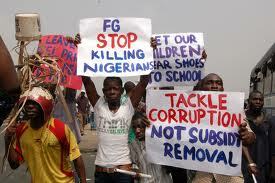 But in the real world, as recent experience in Nigeria and Indonesia shows, the politics are much more complex. One striking fact is that protests are led not by the better off who gain most from subsidies, but by groups that are poorer (although not so poor that they find it too hard to organise protests). This is because subsidies matter proportionately more for those on low incomes, especially when the indirect effects of increased transport costs work through to prices more broadly. Second, while cutting subsidies may in theory free up resources for public goods, in many cases people have little confidence that this will happen given high levels of corruption. In Nigeria, poor people see subsidies as the only benefit they get from the country’s oil wealth. A third issue is that political parties have got used to deploying subsidies as a political tool, trying to wrong-foot opponents – a game that is currently being played out in the Indonesian case. So all in all it is not too surprising that although the G20 governments pledged action to reform fuel subsidies in 2009, little has happened since. It is also unlikely that grand statements about sustainability emanating from the Rio+20 summit will have much effect. But what will, and what is clearly driving events in Nigeria and Indonesia, are rising oil prices. These are now reaching historic highs in real terms and the fiscal burden of fossil fuel subsidies (especially for oil and gas) is becoming untenable in a number of countries. There is a big opportunity here, but there are also big political risks. What is lacking, and what no amount of declarations on new “sustainable development goals” will provide, is a credible political strategy for fossil fuel subsidy reform at national level.